I now have three composing projects lined up. One is a short film made by a student at the New York Film Academy. It's due on Wednesday, so I'll be working hard on it for the next few days! I do not think Val and I will remember 2005-2006 as some of the best years of our lives. It cost us a fortune to move here and get settled in last Summer and half of our stuff got damaged in the process. It took forever to start school and when I did, I was never quite satisfied. It also took forever to find a job. I finally found a part time position, but we've never really had enough income. We've put ourselves further into debt for a degree that I will probably never finish. Next, I decided to leave school and look for more work. Nothing has surfaced. It's frustrating to have five years experience in a job that doesn't have direct parallels to any other occupations. To top it all off, we discovered yesterday that we have to go through a lengthy process to do an update for our adoption (because of the move). Thus ends my rant about 2005/06. Here's a short piece I did relatively quickly today. For lack of a better name, I've called it Looking. The picture below is a screenshot of what I spend a lot of my time looking at. This is what's called a "piano roll" view. It shows midi notes that I've recorded, which can be edited in various ways before I record or "render" the actual audio for various tracks. The horizontal lines in the middle are notes and the length indicates how long each one lasts. The vertical lines toward the bottom of the screen can represent various things. In this case they represent the volume and timbre of a note. I can draw small changes in volume with the mouse. I spend hours manipulating these little lines in various ways! 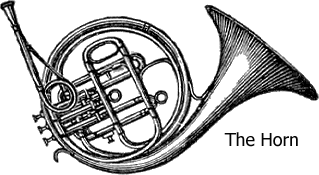 This cue focuses on what is often called the French Horn. Actually, the official name of the instrument is simply "horn." I feel like this cue needs a name so feel free to give me your suggestions after you listen to it. 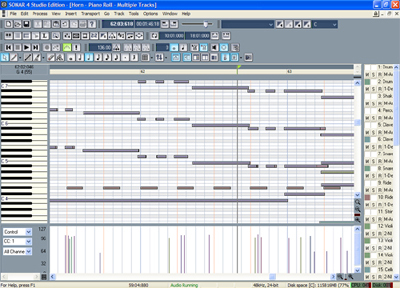 Update: Based on Randall's suggestion, I added a timpani roll near the beginning of the cue. I think it's a nice added touch. Yesterday I wrote a post called The Human Conscience, which talked about the responsibility we have to make moral decisions. In the comments, the example of divorce and leadership was raised and there was some discussion. I think this will be a good example for me to use in continuing to explain my position. We don't always think through the consequences of things. We do things for selfish reasons regardless of the pain or suffering we might be causing. This is where we are helped by the Holy Spirit, by the testimony of the Bible, and by the community of believers. I didn't mention that third aspect in my previous post, but I believe it is key. Being a part of some kind of fellowship restrains us from sin and helps to inform our moral decisions. My basic view of the Bible is that it is to be regarded as a particularly authoritative member of this community. It is "our great cloud of witnesses," to use the phrase from Hebrews 12:1. As we practice the reading of the Bible in our community, it is as if our membership increases. We give these "members" our special attention because of their traditional role in the formation of our community and understanding of the gospel. This is much different than treating the Bible as inerrant or some kind of perfect book. In the comments on the previous post, someone quoted from 1 Timothy 3, which says that an "overseer" should be "the husband of but one wife..." I think the principal in this text is obvious. Our leaders should set a good example. They may have a gift for leadership, but we should also consider their character. The cool thing about this list of qualities is that it includes things we might not think of. How many leaders are not able to be hospitable, for example? Or how often do we admire someone's ability to lead, but ignore the fact that they are not self-controlled? This fits into what I was saying above. We may know, on some level, what makes a good leader, but we prove incapable of making judgments on our own. We need the Holy Spirit, the community of believers, and the larger community that is constituted in the pages of the Bible. We cross a line when we start to make dogma out of a passage like 1 Timothy 3. I think we should let it be there as a guide, not as an exhaustive ruling. I don't think Paul saw himself as the provider of a new set of rules to add on to the old rules. His desire was to express the freedom we have in Christ. This is not a freedom to do whatever we want. Rather, it is a freedom from sin. This did not keep him from providing guidelines to the churches he wrote to. I don't think we should necessarily be afraid of having guidelines either. What is dangerous is when we try to take a principle found in the Bible and make it into a new law. It is simply not capable of it. It is not exhaustive enough. It plainly does not deal with issues that we face today...not in a specific way. It may give us some principles by which we can make up our mind about things, but my point is that it does not specifically spell out what is right or wrong in every situation. We all have a God-given conscience. With that conscience comes a scary responsibility : the responsibility to discern right from wrong. If we follow Christ, we believe that we can cooperate with the Holy Spirit as our guide. Like it or not, however, there is no answer book. In fact, I think that when we look to the Bible as a moral rulebook, we only end up defending the point that we wanted to make in the first place. This has happened with racism and with slavery, for example. In some cases, we just want to be judgmental and we like to quote the biblical authority that backs us up. Please note that I am not advocating relativism, nor am I saying we should take the Bible out of the moral decision-making process. I think that the Bible gives us a unique window into the historical relationship between Yahweh and humankind. In its pages we see how a people called by God have sought to understand that calling. The accounts of Jesus give us perhaps the best insights into just how difficult that process has been and will be. Think about all of the notions that he turned upside down. Think about the difficulty the religious leaders of his day had in understanding where he was coming from. Could that be true today as well? I suggest that we start taking on the responsibility to think through the issues of our day without trying to use the Bible as a crutch. It's not a moral answer book. It is an important guide, to be sure. It is a witness to the Savior that we who are Christians have chosen to follow. The journey goes beyond the page, though. As we face moral decisions every day may we not rely on our agendas, on our desire to be judgmental, or on our desire to sin. May we instead rely on the biblical witness, on the Holy Spirit, and yes, on the conscience that God gave us. Last night I installed the FireWire PCI card I bought for 99¢ on eBay. I got it so that we could upload video from the new mini-DV camera my parents bought Val and I for our birthdays. When I went to look at some of the footage I had captured there was an awful buzzing noise in my headphones. I wondered if something wasn't set up right. It wasn't just that program, though. I ended up actually removing the sound card and it was buzzing even while disconnected! I tried a whole bunch of things and came to the conclusion that I must have fried my $200 sound card with some static electricity. I felt like crying. I prayed about it. Nothing fixed the problem. This morning I woke up feeling pretty depressed about it. We don't have money to be buying a new sound card and even if we had it, I would much rather spend it on something else (like this drum sample software). I dropped off Valerie and Liam at her nannying job and when I got home, I decided I would give it one more try. I had taken the card out last night because I was concerned that it might somehow cause further damage to the computer. I re-inserted it and literally laid my hands on the computer, praying for a miracle. I booted up the computer and the problem was gone. I can't believe it. Maybe one of you who is more knowledgable about these things can give me an idea of what might be going on. The problem actually came back for a few seconds a little while ago, but otherwise my audio is crystal clear again. I just hope it stays away for good. Thank you God!